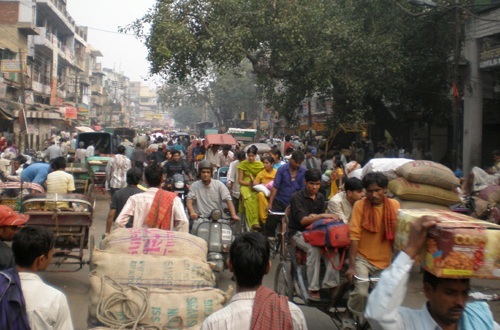 Chandni Chowk – a major street in the walled city of Old Delhi, established by the Mughals over three centuries ago, is one of the oldest and busiest markets in all of North India. The region has retained its historical character amidst considerable urban challenges, and the narrow lanes are now almost always choked with congestion. In the past few weeks, Chandni Chowk featured in the media twice. Once for being declared India’s most polluted residential area and more recently for seeing the launch of solar-powered cycle rickshaws in the capital city. A package to clean the busy Chandni Chowk area has also been declared and solar energy is clearly paving the way for this change! What is interesting about Chandni Chowk is the fact that although tonnes of goods are traded here every day, the market itself has probably the smallest carbon footprint compared to any other market of a similar magnitude. For such is the situation here, that the only convenient way to transport goods (or people) is by pulling or pushing! However, increasing congestion and heavy vehicular movement in the area has earned it the dubious distinction of being the ’most polluted residential area’ for NO2 and suspended particulate matter (SPM) pollutants, compared to 326 other Indian locations. Consciousness of this pollution has raised the alarm on the urgency to bring down the pollutant levels while also highlighting the region as a whole. Perhaps for this reason, the Chief Minister of Delhi chose to launch Soleckshaw: the solar-powered cycle rickshaw at a function in Chandni Chowk last week. Also known as the “green rickshaw,” a soleckshaw weighs 210 Kg, runs at a speed of 15 to 20 Km per hour and can carry load up to 200 Kg. A solar battery of 36 volt, requiring 5 hours of charge, helps it run for up to 60 Km. The Solekshaw has been built by India’s leading science laboratory and is now slated to be produced on a public-private partnership basis. Realizing the need to act on local issues other than climate change, especially to bring down the air pollution in the region, a Rs.100 crore (US$ 20.6 million) project to clean and beautify the busy Chandni Chowk was also announced at the function. Volunteer of Save Environment Movement? Have you heard of climate change? Temperatures are getting higher. Storms are getting worse. Ice is melting and sea levels are rising. Portions of the coast of Bangladesh are likely to go underwater, lost forever. Millions will become homeless. The ability of the earth to sustain people is threatened. Why is climate change happening? Because people are burning up fossil fuels (diesel, petrol, natural gas, coal) at such rapid rates that future generations are now threatened. Is it possible to slow climate change? Yes, but we cannot continue to waste time. Carbon dioxide levels are rising rapidly. That is where the number 350 comes in. If we can limit CO2 in the atmosphere to 350 parts per million then we can avoid the worst of the harm to come. No one person cam stop climate change but everyone contributes something significant. We can slow out own use of fossil fuels by walking and cycling and taking cycle rickshaws rather than using motorized transport. We can reduce our use of electricity. We can avoid, as a nation, burning coal (pure carbon) or selling it to others to burn. We can encourage the government to act to encourage reductions in fuel use and to encourage walking, cycling, and rickshaws. distances to accessing basic needs close to home, we can reduce congestion and all the misery it causes, We can have more time with family and for the other important parts of life. Remember 350 is not just a number. It is not just an ideal. It is something we can all work to make a reality.